Well, until I find another place that might compare with defunct “Sultan Kebap”, yes, one have to concentrate on getting it elsewhere – or make it oneself. Yes, it can actually succeed. I am the first to admit, that I simply did not believe in the project. So I’ve never made Iskender Kebab until a few weeks ago. But holy moly, this it is not the last time I make it !! Have even plans to serve them for the in-laws – I’m are sure my mother in law will also be thrilled (brother in law and sister in law are less discerning and orthodox, so I KNOW they will eat it all – good or not 😉). My husband had certainly light in his eyes and are still talking about the dish, so it has apparently made an impression. Now I’m fabling about Iskender kebab, but it’s not even clea, if you really know what it is? 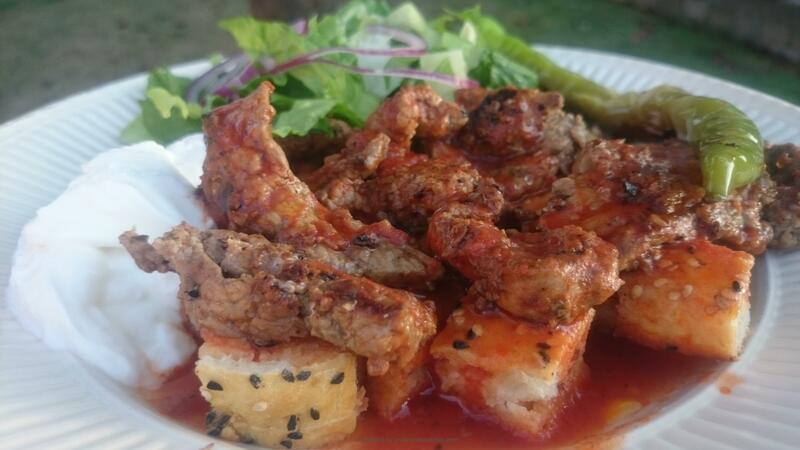 If not, you get a brief intro here: Thin, white bread cut into cubes, fried, marinated meat in thin slices on top, tomato sauce over and possible, a little melted butter on top again. Then a good Turkish yoghurt and a fried green sivri-pepper beside (Sivri-pepper is that strong green bandit who always cheats in intensity). I must honestly admit, that although I found it VERY strange the first time, I had to eat yoghurt along with a dinner-dish, I have since surrendered. It belongs to Turkish food and to this dish it’s simply necessary. Iskender kebab is a dish that was invented in northwestern Turkey, specifically in the town of Bursa, in the late 19th century (one of the reasons it is also called Bursa kebab). Although the dish originally created with Döner (you know the meat standing upright and turn around on a skewer and slowly roasts), it can easily be made from inner thighs of the lamb (I mixed thinly sliced inner thighs with thin sliced tenderloin as it was, what I had just – it just has to be lamb for the best result). Maybe you can grate a leg of lamb on a rotisserie on the grill, if you have such one. 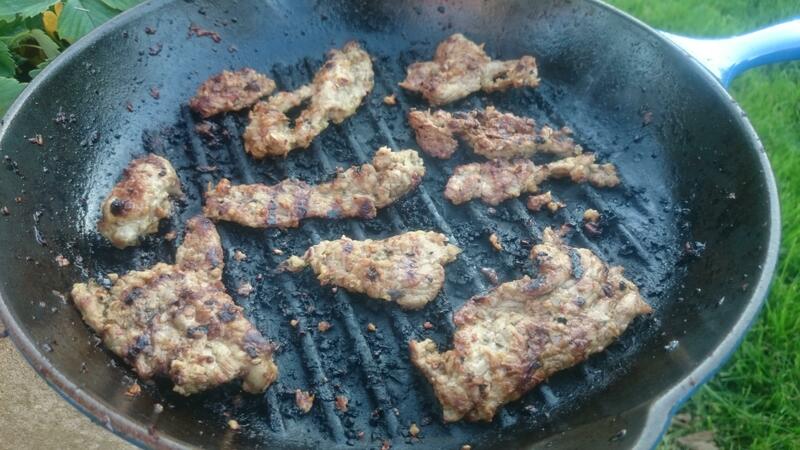 Just be sure to marinate the meat (and make sure there is enough fat to melt – it helps to provide the taste). 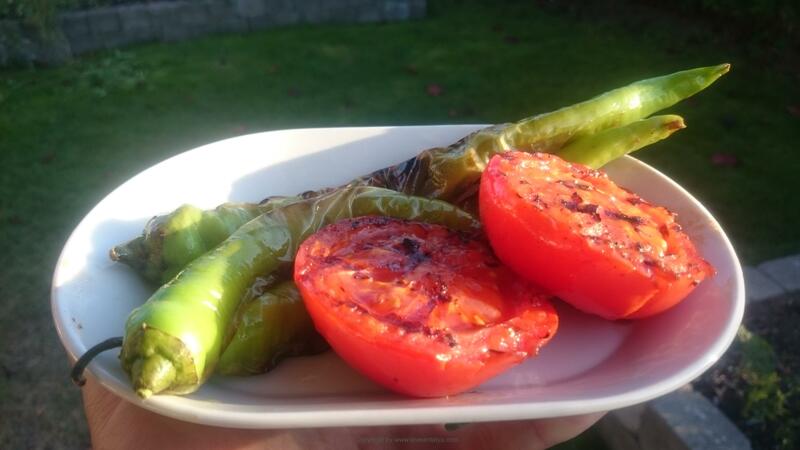 How do I make homemade Iskender Kebab? The meat must marinade the day before and then refrigerate overnight. The bread should be completely soft and freshly baked, otherwise you will regret it. You may want to buy the round pide bread at your local ethnic greengrocer, but it is absolutely best, if you just make the bread and cover it with a cloth, until you need to use it. 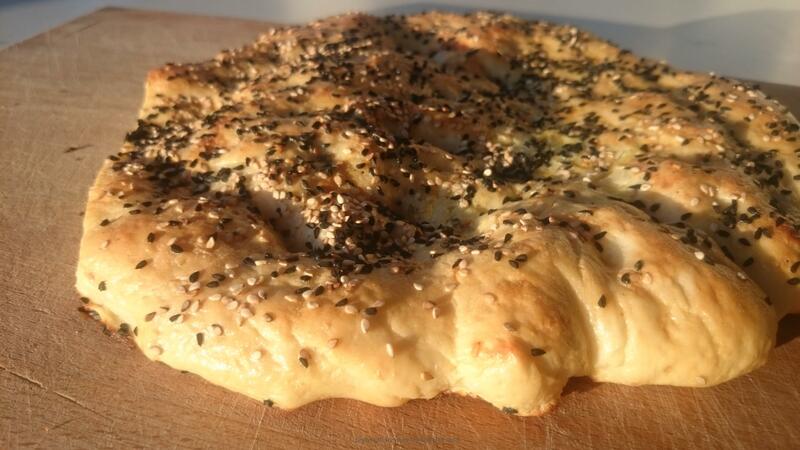 You can get the recipe for Pide ekmek here, it is quite simple and easy to make. So it takes a little time (hence the “Sunday food” as I wrote in the beginning). 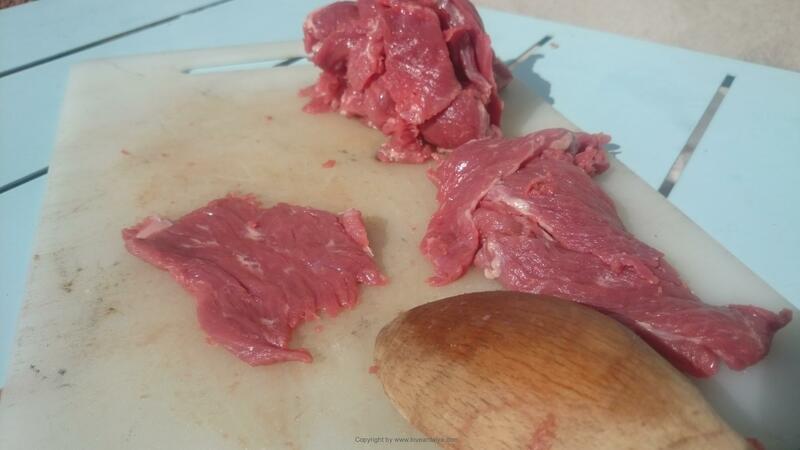 Approximately 900 g lamb – I used the inner thighs and fillet, sliced thin and banquet completely flat with the backside of a spoon. (Some choose to add 1 teaspoon cumin, chives, dried parsley, mixed kebab spices and chilli in, but I don’t think,that it tastes right). It is really only the juice from the onions you need, then sieve the juice for itself and throw the “flesh / pulp” out. 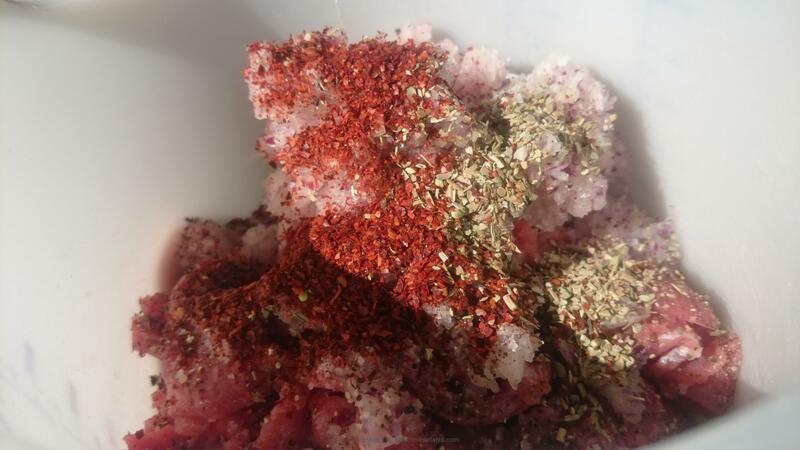 Mix all the spices and onion juice together and pour it in a freezer bag along with the meat. Shake it well. Set aside (but turn it a few times) overnight (or at least 3-4 hours). If you’re a bit like me, then just mix the mashed onions with the rest. I do not have the patience or just do not bother to stand and sieve the juice. I did so and it tasted super (but ok, a bit more onions than the original recipe). You have to make this in good time (preferably the day before), so the rest (besides the freshly baked bread) takes no time. Heat the oil in a small saucepan, mix tomato paste and pepper pasta. Cook a minute or two and then mix it with water. Bring mixture to a boil and turn down the burner, so it simmer for 10-15 minutes until it is used. about 500 g. Turkish yoghurt – stirred together so it becomes creamy and not lumpy from the bucket. Butter Sauce (I used clarified butter, because I could not get hold of genuine Turkish Tereyağı – it just tastes different and is clearly preferable). Roast the meat, while the sauce is simmering – I used a grill pan made of cast iron and it was super good, but should just have a minute or two on each side. The half tomatoes and green peppers Sivri was just turned on the pan, so they had a little black “grill-track” on themselves and looked decorative. Melt the butter in another saucepan. Cut bread into small squares and place them neatly in four plates. Spread the meat over, then a little tomato sauce and possible. butter. Arrange with 1-2 spoonfuls of yoghurt on one side along with the half tomato and the pepper. Server for your family or friends. Allow yourself just to sit back for a moment and see (and hear) how they enjoy it. For it’s guaranteed …!